What are the grounds for divorce in Ohio? Ohio has two major categories for a divorce: no fault and fault. No fault grounds include incompatibility, unless denied by the other party, and living separate and apart without cohabitation for one year. There are nine fault grounds for divorce in Ohio, which include bigamy, willful absence from the marital home for one year, adultery, extreme cruelty, fraudulent contract, any gross neglect of duty, habitual drunkenness, imprisonment of the adverse spouse, and the adverse party’s out-of-state divorce. How long do I have to be a resident of the State of Ohio to get a divorce? Under Ohio law, parties filing a divorce in Ohio must be a resident of the state for six months and a resident of the county in which they file their case for 90 days. A divorce is a court-ordered termination of the marriage based upon the court finding that certain grounds for the divorce exist. A dissolution of marriage is a proceeding in which the parties agree that the marriage should be ended and have agreed to all necessary terms of the termination of the marriage, such as marital property division, spousal support, parental rights and responsibilities, and child support. Can I convert a divorce to a dissolution of marriage if my spouse and I have agreed on everything? Upon the filing of a proper motion, the Court may order that the pending divorce be converted to a dissolution. By the same token, if a dissolution of marriage is filed, but one of the parties does not wish to proceed with a dissolution at the time of the hearing, the matter can be converted to a divorce. Who can I contact for help in choosing an attorney? The Lake County Bar Association’s Lawyer Referral Service may be able to assist you in obtaining an attorney. For additional information, visit the Lake County Bar Association website, or call them at 440-350-5800. What do I do if I don’t believe I can pay for my filing fees? A party may apply for a filing fee waiver by filing a Financial Disclosure Form-Indigency Application. It is available on the Forms & Filings page. This filing is subject to Court approval, in accordance with Local Rule 20.03. My complaint for divorce has just been filed. What can I expect next? After your spouse is served with the complaint, the Court will issue notice that the matter has been set for a case management conference. Prior to the case management conference, if you request, and the Court finds it appropriate, the Court may order child support and spousal support during the pendency of the divorce. At the case management conference, issues in your divorce regarding your spouse’s property, your property, and your children will be discussed. Your case will be set for trial. If it appears necessary to the Court, or if counsel requests, a guardian ad litem may be appointed for the children, the matter may be sent to mediation, or expert witnesses may be determined necessary to fully explore all of the issues in the case. Your case will be heard by the Judge or a Magistrate. A Magistrate is a Court-appointed judicial officer whose job it is to hear all of the facts, reach conclusions of law, and issue a written decision. More information is available on the Magistrates page. If you disagree with the Magistrate’s Decision, you can file written objections, which the Judge decides. Objections to the Magistrate’s Decision must comply with the requirements set forth in Ohio Civil Rule 53(E)(3). Can I call the Court with questions about my case? The Judge and all employees of the Court are prohibited by the Canons of Judicial Ethics and Ohio law from communicating with either side of the case on a matter that may come before the Court. For this reason, the Court cannot accept phone calls or e-mails wishing to discuss the facts of your particular case. The Court can only answer procedural questions. For information about your case, click here for the Clerk of Court’s online docket. Why can’t I email the Judge or Magistrates about a case? No email addresses are given because the Judge and Magistrates assigned a case can only receive evidence in the Courtroom and read properly filed documents in the case record itself. Anything else is prohibited by the Code of Judicial Conduct, Canon 2, Rule 2.9 of the Supreme Court of Ohio. Staff cannot be emailed either, lest improper information outside of Court is passed on to the hearing officer. The Court is always accessible by telephone. Please call (440) 350-2708. How can I get a Domestic Violence Civil Protection Order? For information about Civil Protection Orders, visit the Domestic Violence page. For Civil Protection Order forms, visit the Forms & Filings page. How can I find out my Court date? Check the Lake County Clerk of Court’s Docket. To get online access to the Docket, click here. I can’t come to Court on the date of the hearing. How do I get a new date? You can file a motion for continuance pursuant to Local Rule 7. Please understand that just because you file a motion for continuance that does not mean that it will be granted. A form motion for continuance is available on the Forms & Filings page. Continuances are not always granted. You must contact the Court at 440-350-2708 or click here to check the docket at the Lake County Clerk of Courts to see if the motion is granted. If the motion is denied, the hearing will go forward as scheduled even if you are not present. Where can I get copies of my Court papers? Copies of Court documents are available at the Lake County Clerk of Courts. They are located in the lower level of the Lake County West Annex at 25 North Park Place, Painesville, Ohio 44077. For additional information, call the Lake County Clerk of Court’s Office at 440-350-2556 or click here to search the docket online. How can I get a copy of my divorce decree? 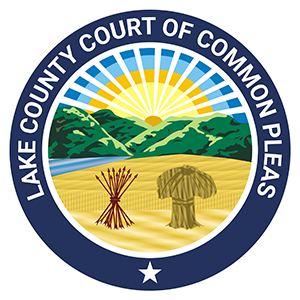 Certified copies of divorce and dissolution records or decrees are available at the Lake County Clerk of Court’s Office. Their phone number is (440) 350-2657, and their website is available here. How do I get a recording or transcript of a hearing? Visit the Recordings and Transcripts page for more information and helpful forms for requesting a recording and obtaining a transcript. Does the Domestic Relations Court issue marriage licenses? No, the Domestic Relations Court does not issue marriage licenses. Marriage licenses are issued by the Probate Court. They are located at 25 North Park Place, Painesville, OH 44077, in the Courthouse Annex building. The Probate Court’s phone number is (440) 350-2626, and their website is available here. How do I contact the Lake County Child Support Enforcement Agency (CSEA)? You may contact the Lake County Child Support Enforcement Agency at 440-918-4000 (Cleveland line); 440-298-3357 (Madison line) or 440-350-4000 (Painesville line) to speak with a representative of the Agency. For more information on their website, click here. What do I do if I change addresses? To keep your address current with the Court, you must file a change of address form. This form is available on the Forms & Filings Page. What happens when a parent files a notice of intent to relocate? Filings of a notice of intent to relocate are governed by statute. Ohio Revised Code section 3109.051 speaks to this procedure, and is available here. What do I do if I change employment? If you are the obligor (i.e. the person who is ordered to pay support) you are required by law to notify the Lake County Child Support Enforcement Agency if you change employment. Also, if you are unemployed and have been placed under an order to attend a Parent Opportunity Program, you must report any new employment immediately so that a wage deduction can be processed. You may report your employment by contacting the Lake County Child Support Enforcement Agency at 440-918-4000 (Cleveland line), 440-298-3357 (Madison line), or 440-350-4000 (Painesville line) and speak to a representative of the Agency. Where can I find information on my child or spousal support accounts? The Lake County Domestic Relations Court does not maintain payment records concerning child or spousal support accounts. The Ohio Department of Job and Family Services, Lake County Child Support Division, maintains these records. They can be reached at (440) 350-4000. **PLEASE HAVE YOUR 10 DIGIT SETS NUMBER WHEN YOU CALL** For more information, click here. You can also create an account with the Department of Job and Family Services to view your information online. To create an online account, click here. I have not received a child support or spousal support check. Who do I call to find out the status of these payments? The Court does not keep track of support checks. All support checks are issued through the Ohio Child Support Payment Central, P.O. Box 182372, Columbus, Ohio 43218-2372. You may call 1-800-860-2555 to see if a payment has been posted to your account, or click here for more information. I received a Hearing Notice concerning a Motion to Show Cause filed by the Prosecutor’s office regarding my former spouse not paying child support. Do I have to attend the hearing? Please contact the Lake County Prosecutor’s office at (440) 350-2683 and ask to speak to a IV-D Prosecutor. For more information, click here. My ex-spouse and I have agreed that we do not want the Child Support Enforcement Agency to handle our child support. Can we agree that the payments be made directly between the two of us? No. Ohio Law requires that all child support must be made through the child support system. Neither the Court nor the parties can waive this requirement. As a result, all child support orders will require payments through the Ohio Child Support Payment Central.